Part of the beauty of Windows Phone is its simplicity and stable performance across devices, but one thing Microsoft had to sacrifice in order to achieve this was customization options. Sure, you can change the color of those Live Tiles and some of them would get dynamically updated with images of your contacts or just your photos, but there’s a great deal of them that are just a logo on a single-color background. 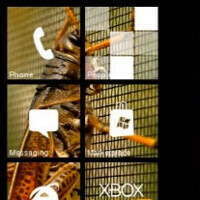 It no longer needs to be that way - Themes for Windows Phone brings customization up a notch. The app allows you to apply your own images to the tiles, making WP more colorful than ever. The program however is only available on Windows, and it requires you to have your WP device unlocked. So before you start tinkering around, make sure you’ve already gotten acquainted with ChevronWP7 (costing you $9). Also, check out the video demonstration below showing you all the newfound beauty of Windows Phone. It was only a matter of time. People like options & customization. Already Microsoft is showing that it can be done to Windows Phone 7.5 Mango even if the phone needs to be unlocked. This is really a huge great step in the right direction. Its got to start somewhere. You are right, but Microsoft has a platform that people care enough about to try to modify or customize. If Microsoft were smart they will embrace this. I think that they will. Windows has a long history of customization, & I feel that Windows Phone 7.5 Mango will follow suit. true. ive said multiple times (and this is something i say to customers too) that WP7 takes the great parts of android and iOS and tries to fuse them together into a middle ground between ease of use and functionality. It still leans closer to the iOS side of the fence, but we will see if that lasts forever. There is a big 3 in the mobile world. Google, Apple, & Microsoft. I am an Android fan, but I believe that Microsoft will be a huge player in 2012 & 2013. I really feel that Apple hasn't done enough to keep up with the likes of Android's Ice Cream Sandwich & Windows soon to be released WP8. I think if anyone will start to fall it will be Apple. They are doing the same thing RIM & Nokia did. They are sitting on their laurels & not doing enough to keep their customers engaged. If you give an iOS 5 user an Ice Cream Sandwich device or even a Windows Phone Mango device they will be pleasantly surprised because their iOS 5 is just more of the same old same old. People want changes, upgrades, new interactions, so on and so forth. I really believe that Google & Windows are providing that. Their communities are showing their love for their OS. Android has a long history with its root community & this is the first step toward that same direction for Microsoft’s WP. It’s funny but when people jailbreak iPhones they usually do to get the features that are already hits on stock Android. Ironic isn’t it? I remember reading that Microsoft "teamed up" with ChevornWP7 in some way. Keeping that in mind, I wouldn't be surprised if Microsoft made something like this official. Thanks for that, Schmoa. that is exactly what happened. Chevron worked with engineers from.WP before releasing their app. They had several delays as Mango updates to 1st gen devices became active. But I do agree this type of customization should be a no brainer for WP devices. While WP may never rival Android in that area, a little imagination can help here. Consumers like to play with their phones. Give 'em some tools to tinker. If they didn't they would of killed the chevronwp7 people insrtead of bring them into the fold. WP7 might not have the customization while locked but MS also doesn't go bats**t crazy about people unlocking it. i hate WP for missing this exact option..now WHY isn't this available on their marketplace? They just now adding this? iPhone and the controversial Android has been doing this for ages. Awesome this is just strengthening my opinion on purchasing a Windows Phone. Just waiting on that Lumia 900 to come out.